Aloha Music Camp Meets E Kanikapila Kakou! Who’s Coming Up on Monday, February 15? Who’s Coming Up on Monday, February 15? 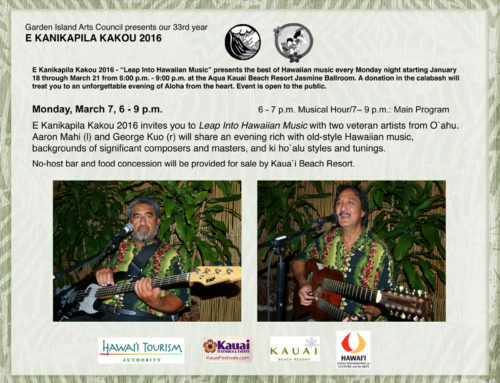 Monday, February 15, 6 p.m. – 9 p.m.
7 p.m. – New to EKK, Lito Arkangel and Dwight Tokumoto from Hawai`i island will share their music and message with you. These words were coined by the emcee of the AMC artists/instructors, Alan Akaka, a leader in the world of reviving and promoting the steel guitar. He did a masterful job of introducing and giving each artist a chance to share and to shine in the third year that EKK hosted “Community Aloha Night.” Once again the EKK audience could get a chance to hear the music and stories of so many talented kumu – ‘ukulele superstar Herb Ohta Jr. of O’ahu, well-known slack key artists Kevin Brown of Maui and John Keawe of Kohala, Hawaiian language expert Kaliko Beamer Trapp of Hawai`i island, kumu hula Uluwehi Guerrero of Maui, chanter Liko Puha who comes all the way from California, and Konabob Stoffer of Hawai`i island who handles a lot of the AMC coordination. Additional AMC instructors who were not on the stage are Calvin Hoe of O`ahu, Mauli’ola Cook of Kaua`i, and luthiers Dennis Lake and Bob Gleason of Na’alehu on Hawai`i island. Alan skillfully maneuvered through the line-up. As they moved from one favorite song to another, it was thrilling to see each artist adding their unique style and instrument to the musical round robin. Like the “hot potato” game, each musician took a turn and quickly passed it on to the next musician with a nod, a wave, or by calling a name, never missing a beat until the whole song had been sculpted and shaped by each musician. It was interesting to hear how the basic song morphed ever so slightly as it moved from one artist to another. In between the music, the artists shared stories prompted by questions posed by Alan. Sanoe by Queen Liliu`okalani was played by Herb Jr. Alan asked him if he would rather sing it. Herb’s quick reply, “No! Oh no, no, no!” On his new CD titled My ‘Ukulele World, Herb actually sings the vocal to his song. According to Alan, hearing Herb sing is as rare as a baseball card. As Herb picked out the melody on his `ukulele, Alan added the romantic strains of the steel. If you closed your eyes, you could picture dancers in formal dress in the days of the Monarchy as they waltzed gracefully across the ballroom floor. The one thing that each artist did before they began to sing was to call out the Key they were playing so everyone could be on the same page musically. “Key of G!” called out Kevin Brown as he started Island Style written by John Cruz. Of course the whole audience could follow along with the lyrics to this well known local favorite. “Key of C” called out Kaliko as he began Israel Kamakawiwo`ole’s Panini Pua Kea and passed the song down the line for others to add to it. John Keawe chose a Dennis Kamakahi classic,Wahine `Ilikea, to which many in the audience could sing along. “Key of A!” shouted out Liko Puha as he started He Nani Mokihana, a Kaua`i song by Chinky Mahoe which is on one of the Makaha Sons CD. A chanting instructor at AMC, Liko’s physical presence is so commanding as he boomed out the opening pule at the beginning of the show; he’s a gentle giant with his ever-present huge smile and even bigger heart. Uluwehi is ready with his performance as well, as he called upon two of his hula dancers from Hokkaido, Japan. Known as “Uluwehi’s butterflies”, the two gorgeous dancers – Ku`uipo and O-Chan — in casual teal sundresses, stepped up to dance. In his melodic voice, Uluwehi sang Kipahulu by Hoku Rasmussen, who taught the Honolulu Boy’s Choir for many years. Kipahulu, birthplace of his great grandmother, is on the hot side of Maui island as you drive back from Hana. It is the resting place of famous aviator Charles Lindbergh. “Key of F-u!” called out Uluwehi, as he would pronounce it in Japan. Shouts of hana hou called for another hula by the Hokkaido hula dancers. “If you came all the way from Hokkaido, you need to do a hana hou!” Uluwehi introduced Pua Ahihi, a collaboration by Mary Kawena Pukui and Maddy Lam who wrote so many beautiful songs that became classics in the world of Hawaiian music as well as the world of hula. Musical instruments are also showing up in many countries. When asked how he came to make his unusual stick bass, Konabob Stoffer shared that one day he was watching someone play a rope attached to a stick on a washtub. Unable to locate a 40-gallon gas can, he thought that perhaps he could make similar sounds with easily accessible 2 x 4 sticks and weed whacker cord. It worked! Up to now he has made 470 of his unusual praying-mantis-looking stick basses which are now being played in the US, Germany, Japan and other countries. Emphasizing the kanikapila jam style that musicians share at parties and casual gatherings the artists shared songs that were pulled from archives; we have not heard some of them for years. Moanalani Beamer will be teaching hula to an old almost-forgotten favorite from when we were kids. Puka Puka Pants by Eaton “Bob” Magoon was certainly a favorite long ago; it’s good that it’s not forgotten and will probably now see a revival along with the trendy new puka puka jeans which are higher priced the more pukas they have on them. Amazingly, the musicians all seemed to know this old party favorite. Bob Magoon, Ed Kenney and Gordon Phelps also collaborated and wrote Numbah One Day of Christmas in 15 minutes as they ate Chinese food at a Diamond Head home in the 1950’s. The song endures to this day and helped to legitimize the use of pidgin English in Hawai`i. Kevin Brown responded to a song request from the audience with the familiar strains ofMr. Sun Cho Lee also by Bob Magoon and popularized by Ed Kenney. This song has become so popular not only at backyard parties but on the big stages. The original first verse about the stingy pa-ke man has grown into a full-blown description of every ethnic group under the witty and humorous pen of Keola Beamer. The lyrics poke fun at the excesses and stinginess of a “representative” of every ethnic group that comprises the landscape of races that came together as plantation towns were populated with immigrant workers from many countries. Alan directed the question to each artist to share his own experience growing up in this ethnic stew pot of races, cultures, foods, language, pastimes and relationships. The results were an amazing very funny sharing of stories like you would hear sitting around in the garage. They all recalled playing marbles, hopscotch and jacks with their small-kid-time friends of many colors. Uluwehi said that growing up in Hawai`i, all our families worked in the same place (plantations), everyone lived in the camps and there were no fences, we ate each other’s food and grew up together. Uluwehi shared a funny story about his sleepovers at his friends’ homes. His mother asked him if he was going to church with the family. “But they Buddhist,” he told her. “Never mind! You go church with them!” she insisted. Herb is a man of very few words but what he says always packs a punch. “Hawai`i is so different; besides the weather, what brings you back here?” was the question posed. The reply was that people on Kaua`i are so friendly. To capture this in song, Uluwehi called out “Key of G!” and shared the beautiful and nostalgic Honolulu, I’m Coming Back Again! This is a sentiment shared by many in attendance at EKK . . . the prime example being our “Snowbirds” who fly back each year when they hear the strains of Hawaiian music calling to them in their snowy ice-covered homes on the continent. A special treat was that Moanalani went up unexpectedly and thrilled everyone with her amazing hula. A true hula goddess, Moanalani obliged to shouts of hana hou and went up to the stage to dance Hi`ilawe. Smiling broadly, Kevin Brown pointed out how wonderful hula dancers looked from the back. We interrupted the program to give away our Kamoa ‘ukulele which was a beautiful instrument with a plug-in “puka.” The most amazing thing is that for the third time in a row, a member of the Aloha Music Campers was the over-elated winner of this generous donation from Kamoa `Ukulele. Yvonne Panapuanani is a Hawaiian living in Boulder, Colorado who comes to AMC each year to learn the hula. She nearly fainted when her name was called. Happy! Happy! Led by Herb Jr., Hene Hene Kou `Aka was the perfect song for the kanikapila jam session; it gave everyone one last chance to shine. They moved smoothly into the formal ending of the night with Hawai’i Aloha. In his fluent Hawaiian, Kaliko wrapped it all together in a final pule. He, together with Uluwehi and Liko had started the evening with an in-depth introduction to `Olelo Hawai`i in Hawaiian Music that gave the audience a chance to dig deeper into the meaning of the lyrics that make up the songs that they all love so much. 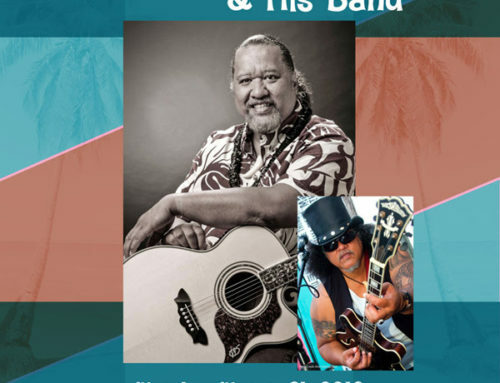 Garden Island Arts Council feels privileged to once again bring the Aloha Music Camp artists, so rich with talent, heart-felt sharing and a genuine feeling of aloha in all they do, to perform at the EKK program. Hope to see you all next year!